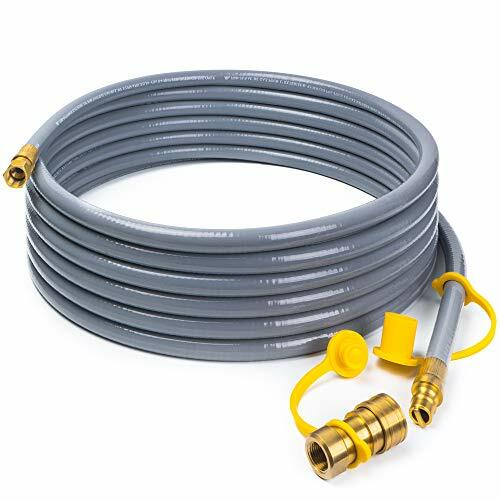 This 24' Natural Gas patio hose assembly has a 3/8" female pipe thread x 3/8'' male flare quick connect/disconnect with dust plug and cap. Most commonly used to connect Natural Gas or LP appliances to an existing low pressure supply. 24 Feet Flexible hose used in natural gas or propane applications to an existing low pressure supply. Functions effectively with natural or liquid propane gas; unites LP grills, natural gas grills and RVs to permanent fuel sources. 50000 BTU/hour flow capacity,3/8" female pipe thread x 3/8'' male flare quick connect/disconnect.Outlet Connection: 5/8inch. Attaches appliance to existing low pressure supply. Comes with dust cap and plug to protect the brass. Safety - Pass CSA certificate, excellent sealing quality is promised for your safety. If you have any questions about this product by X Home, contact us by completing and submitting the form below. If you are looking for a specif part number, please include it with your message.